The text begins by looking at the current state of physical therapist education across the continuum, from professional education through residency, then continues by describing exemplars of excellence and best practices that were observed in academic and clinical settings. Through this survey of the profession, a conceptual model of excellence in physical therapist education is derived and presented with practical recommendations. Finally, after looking at the current state of physical therapy education, Educating Physical Therapists looks to the future, providing a reimagined vision for what professional education and the profession could be. These recommendations for growth come with commentary by international experts in physical therapy education, providing a wide range of perspectives. After an intensive examination of physical therapist education, Educating Physical Therapists is designed to change the way educators and administrators across academic and clinical settings prepare physical therapists for the future. Gail M. Jensen, PT, PhD, FAPTA, FNAP is Dean, Graduate School and College of Professional Studies and Vice Provost for Learning and Assessment, Professor of Physical Therapy, and Faculty Associate for Center of Health Policy and Ethics at Creighton University in Omaha, Nebraska. She holds a BS in education from the University of Minnesota, and an MA in physical therapy, and PhD in educational evaluation both from Stanford University. Dr. Jensen served as principal investigator for the research on Physical Therapist Education for the Twenty First Century (PTE-21): Innovation and Excellence in Physical Therapist Academic and Clinical Education, that is the focus of this text. Dr. Jensen is a qualitative researcher well-known for her scholarly publications related to expert practice, clinical reasoning, professional ethics, educational theory and interprofessional education and practice. During her career she has held faculty appointments at Stanford University, Temple University, The University of Alabama at Birmingham, Samuel Merritt University, and Creighton University. She has coauthored/edited several books, including: Handbook of Teaching for Physical Therapists, Third Edition; Leadership in Interprofessional Health Education and Practice; Realising Exemplary Practice-Based Education; Expertise in Physical Therapy Practice, Second Edition; Educating for Moral Action: A Sourcebook in Health and Rehabilitation Ethics; and forthcoming books Clinical Reasoning in the Health Professions, Fourth Edition, and Clinical Reasoning and Decision Making in Physical Therapy. Dr. Jensen is a Catherine Worthingham Fellow of the APTA and a fellow in the Physical Therapy Academy of the National Academies of Practice. She is a recipient of the APTA’s Rothstein Golden Pen Award, Lucy Blair Service Award and was the APTA’s 2011 Mary McMillan Lecturer. Elizabeth Mostrom, PT, PhD, FAPTA is Professor Emeritus at Central Michigan University where she previously served as Professor and Director of Clinical Education for the Doctoral Program in Physical Therapy, School of Rehabilitation and Medical Sciences. She holds a BS degree in health education from West Chester State College, an MS in physical therapy from Duke University, and a PhD in educational psychology from Michigan State University. Dr. Mostrom is a qualitative and education researcher whose scholarly publications and presentations span the areas of student and professional learning and development, clinical education, and qualitative methods. She has been a contributing author to several books including the first and second editions of Expertise in Physical Therapy Practice; Handbook of Teaching for Physical Therapists, Second Edition; and Realising Exemplary Practice-Based Education and Educating for Moral Action: A Sourcebook in Health and Rehabilitation Ethics. 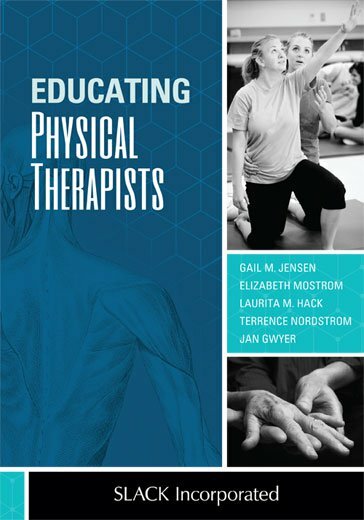 She coauthored/edited Handbook of Teaching for Physical Therapists, Third Edition with Dr. Jensen. She is a co-investigator for the study described in this book, Physical Therapist Education for the Twenty First Century (PTE-21): Innovation and Excellence in Physical Therapist Academic and Clinical Education. Dr. Mostrom is a past editor of the Journal of Physical Therapy Education and is a Catherine Worthingham Fellow of the APTA. She is a recipient of the APTA’s Mary McMillan Scholarship and Lucy Blair Service Award and was the APTA’s Education Section Polly Cerasoli Lecturer in 2013. Laurita M. Hack, PT, DPT, MBA, PhD, FAPTA is Professor Emeritus at Temple University. Dr. Hack holds a BA from Wilmington College; an MS as the first professional degree in physical therapy from Case Western Reserve University; an MBA from the Wharton School, University of Pennsylvania; a PhD in higher education administration from University of Pennsylvania; and a DPT from the MGH Institute of Health Professions. She is a coauthor of Expertise in Physical Therapy Practice, Second Edition, and several related articles, supplying the original research on development of expertise in geriatric practice for this body of work. She has also coauthored Evidence into Practice with Dr. Jan Gwyer. It is a text on the integration of clinical decision making, respect for patient values, and evidence from the literature into practice. She is currently a co-investigator in the grant, Physical Therapist Education for the Twenty First Century (PTE-21): Innovation and Excellence in Physical Therapist Academic and Clinical Education. This study has resulted in several presentations, articles, and this text. Dr. Hack has extensive clinical experience in outpatient, nursing home, and homecare practice, especially in geriatrics, and has taught in the areas of practice management, geriatrics, clinical decision making, critical inquiry, evidence-based practice, ethics, communications, and health care systems. She has served the APTA as President of the Community/Home Health Section, the Health Policy Section and the Education Section. She has also served as Vice Speaker and Secretary of the APTA. She is a Catherine Worthingham Fellow of the APTA and has received the APTA’s Lucy Blair Service Award and Baethke-Carlin Award for Teaching Excellence. She is the APTA’s 2018 Mary McMillan Lecturer. Terrence Nordstrom, PT, EdD, FAPTA, FNAP is a Professor of Physical Therapy and the Vice President of Enrollment and Student Services at Samuel Merritt University. He previously served as the Director of Clinical Education and as Chair of the Department of Physical Therapy at Samuel Merritt University. He holds a Bachelor of Arts degree from the University of California Santa Cruz and a Master’s degree in Physical Therapy from Stanford University in California. He received his Doctor of Education degree in Organization and Leadership from the University of San Francisco in California. Dr. Nordstrom has coauthored articles and book chapters in the areas of ethical reasoning and education research. He is currently a co-investigator in the grant, Physical Therapist Education for the Twenty First Century (PTE-21): Innovation and Excellence in Physical Therapist Academic and Clinical Education. This study has resulted in several presentations, articles, and this text. Dr. Nordstrom was in clinical practice for 30 years in acute care, home care and outpatient services. He held leadership positions in rehabilitation in an outpatient clinic and an academic medical center and was a co-owner of 2 independent physical therapy services. Dr. Nordstrom has held several leadership positions in the APTA, including as President and Vice President of the American Council of Academic Physical Therapy, the Ethics and Judicial Committee, and serves as an on-site reviewer for the Commission on Accreditation in Physical Therapy Education. He was named a Catherine Worthingham Fellow of the APTA in 2015. Jan Gwyer, PT, PhD, FAPTA is Professor Emerita at Duke University. She served as a Professor of the Doctor of Physical Therapy Division, Department of Orthopaedics, School of Medicine, Duke University, Durham, North Carolina. She holds a Bachelor of Science Degree from the Medical College of Virginia and Master’s and Doctor of Philosophy Degree from the University of North Carolina at Chapel Hill. Dr. Gwyer has been a practicing physical therapist for 45 years, in both inpatient and outpatient settings, with her practice focused on aspects of rehabilitation for adult patients. She has been an educator and researcher for over 30 years. Her expertise focused on higher education, clinical education, career patterns, and workforce issues in physical therapy. She is a coauthor of the first and second editions of Expertise in Physical Therapy Practice, and several related articles, that led to the research project that resulted in this book. She has also coauthored with Dr. Laurie Hack Evidence into Practice, a text on the integration of clinical decision making, respect for patient values, and evidence from the literature into practice. Dr. Gwyer has held several leadership roles in the APTA, serving on the board of the American Physical Therapy Specialists, the Clinical Instructors Education Board, and on the APTA Board of Directors. She has received APTA awards including the Lucy Blair Service Award and the Catherine Worthingham Fellow of the APTA.